First, the whole notion that a $14 trillion economy can be measured on any level 3-4-5 days after a month end is preposterous. Anyone who has worked for a public corporation who has to report the SEC knows how hard that is for even 1 single company - not to mention an entire economy. Second, as we've outlined for over 2 years many of our economic reports have been "juiced" to the sunny side because apparently the people cannot handle the truth - the monthly labor report is among the worst with the "revisions" over the years. If you are newer to the website please spend some time this weekend revealing to yourself what is behind the curtain. It is too annoying to go over each time but I've summarized the countless ways these figures have been cajoled in this piece [Apr 3, 2009: Real March Unemployment Rate Reaches 12.5%] - one only wishes the mainstream media would do the same homework. Know this, if the government still reported unemployment as it did pre early 1990s when politicians started deciding the old ways no longer are palpable to the public, our unemployment rate would be about 4% higher than "as reported". That goes for the "good times" in the middle of this decade as well - i.e. when we were told unemployment was 5%, it was really closer to 9%. So each time you hear the economy is only "as bad as early 1980s", realize it is far worse - the "adjusted" numbers of 2009 are as bad as the early 1980s... but the unadjusted numbers i.e. an apple to apple comparison (as close as I can get it) shows us somewhere near 14%. All the 'explaining away' of reality provides a 4% variance so whatever you hear on the national nightly news... add 4%. *That* figure can be compared to the late 70s/early 80s or whatever period of time people wish. We are in the worse labor slump since the Great Depression - by a long shot. Here is another reason these figures are absurd and wasting time analyzing them is useless... and it shows how even more absurd it is the lemmings of Wall Street react to these figures as if they are truth. The Labor Department today also published its preliminary estimate for the annual benchmark revisions to payrolls that will be issued in February. They showed the economy may have lost an additional 824,000 jobs in the 12 months ended March 2009. Let's sit back and think about that for a moment; with the caveat that the data is somehow close to being accurate. Remember all those "better than expected" employment figures we rallied on? Remember all that market capitalization we added to the stock market as economists forecast job losses of 400K in month ABC, and it came in at 375K instead? Do you see what a farce it all is? Now as we sit here in October 2009, WAY after the fact, the government comes in and says "oopsie" we were off by 824K jobs in aggregate on all that data we gave you. Divide that by 12 months and you get about a 70,000 jobs a month UNDER statement. And you want me to buy or sell stocks based on this sort of accuracy? Well that's what Wall Street does each month. The only surprise to me today was that people are surprised! Sure in a few months we'll have -100K job losses as reported by government (which in reality, ex government distortion, will be -250K months), and then after that in 2010 we'll have some months of positive growth (which probably will mean no growth in reality). But at this point, 1/3rd of our entire work force is in government or pseudo government sectors (education, healthcare) so there are only so many jobs left to lose in the private sector without emptying out every Starbucks bistro. We'll clap like seals next year, and say everything is fine. That's what ostriches do when they see a hole in the sand. Here is the reality - this is not something that just happened the past few years. We've hollowed out our economy as we transform into a SHAM WOW service economy. Manufacturing has dropped from mid 30% of the economy a few decades ago to 12%. Replacement for those jobs? (good question - I guess new bars and restaurants) The main job growth the past decade in the private sector has been "building homes" (blue collar) and "financing homes" (white collar). Millions upon millions of jobs have been dependent on a Federal Reserve driven bubble. Until Ben Bernanke can replicate the magic of Alan Greenspan and reinflate housing, those jobs are not coming back. So we need new bubbles. Be patient, Ben is working each month on making that happen. What America has become is basically parallel to any old school technology company which is losing its edge. As it stagnates, it still wants to please Wall Street and post "good numbers". So what does it do? It cuts expense - generally they take a huge ax to Research & Development. What does that allow it to do? To provide a pretense of "stability" and by not investing in its future it allows said company to "beat the number" today. That can go on for a while... but it is a mirage. You are cutting off your nose to spite your face. Then one day you wake upand there is little left to cut and the company is exposed for what it truly is. That is what has happened to the US economy, but over a longer period of time. And with the caveat that unlike the company, the government can print money to hide reality for a much longer period. It is now being exposed, SLOWLY but SURELY. We have not invested - we have not educated properly - we have done smoke and mirrors for a decade now, going through stock market bubbles and real estate bubbles to compensate for lack of job growth & wage growth in the middle class. And now the bill is coming due. But only the first installment of the bill. And we are STILL IN DENIAL. We have not created 1 (net) private sector job in a decade. 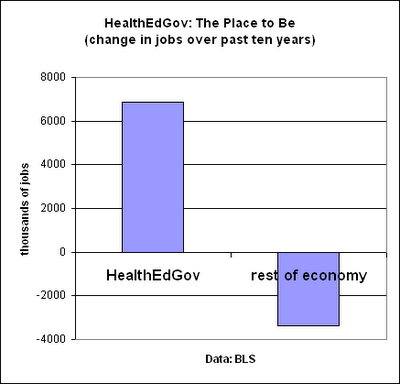 [Aug 14, 2009: No New Normal Say Economists; Prosperity Without Jobs?] What have we created instead? 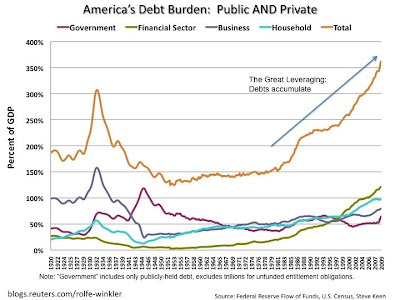 More and more unfunded liabilities for the future generations to deal with - job growth is surging in federal government and healthcare - effectively we are transferring our jobs from the private sector the public. Why can this happen? Because in the private sector you have to pay your bills now. You cannot create jobs unless you can pay for them. (unless you are bailed out by government!) In the public sector, on the other hand, you can create jobs today and not worry about paying for them for decades... that is what our federal government and healthcare systems are. Many state and local government jobs are attempting to do the same thing. I read in the past two weeks that in Michigan there are 18 job seekers for every 1 job. Nationally, that figure is 6 job seekers for each job. In Washington D.C.? 1 job seeker for every 1 job. Do I need to say anything more about what is happening? Our dynamic globally competitive system is creating a plethora of opportunity... in Washington D.C. But as a stock market speculator I have to put that all aside - I cannot care about Main Street because Wall Street could care less. This country is about Wall Street - the Federal Reserve has let us know that with its actions the past 2 years. I could make a case this is a golden era for the multinational corporation. Why? Because "capitalists" do not need you anymore. [Sep 22, 2009: BusinessInsider - The Real Problem is the Economy Does Not Need you Anymore] The Fed is happy to provide cheap capital at any cost, and throw the savers of the nation under the bus. Devaluing their money is now a national past time. And it gets better from there. Here is the game we are playing and why the stock market could still do fine (for a time) as the economy continues to stink (for a long time). America dominates the world in multinationals. Those multinationals do not need American workers - much of the work (except in the corporate suite of course) could be done anywhere. So even with flat lining revenue, costs can shrink big time. Method 1: wage stagnation - that's been happening for a decade. As less jobs are out there in the private sector, and more workers compete for them - wages can stagnate. Or even drop. [Sep 4, 2009: Job Seekers Across America Willing to Take Substantial Pay Cuts] Method 2: move the jobs offshore for the real savings. But you argue ... companies will just shoot themselves in the foot! Without us (us = the great American consumer machine) being able to buy things how can these companies thrive? Well we're not in 1920 Henry Ford time anymore where the thought was people on the line needed to be able to afford what they make. Again, if you drop your costs 30-40-50% as a corporation, your revenue can stagnate or even drop and you can do well. (you saw the last earnings report season right?) Asians can pick up some of the slack in revenue growth - that helps. But here is the biggest kicker: the US government will "fix things". Boo yah! Do you see why it can be a golden age for the corporation? He can move his labor force anywhere on the planet. And politicians desperate to keep their own jobs can just layer more debt onto future generations to hand off monies to the voters of today! (employed and unemployed). That money stolen from the future can then go to boost the top line of corporations over and above where they would be in a real free market. Only 1 person loses in this - the future generation. So we have to separate the stock market from the real economy - I can in fact make a case this might be the best 10 years ever coming for our largest, global companies. Unfortunately the vast amount of jobs in America are created by small companies which are being stomped on. Main Street. Wall Street. 2 worlds - unless Wall Street needs a bailout, then Main Street = Wall Street. So what we have here as we've transformed to this "service economy" is nothing more than a subsidized economy... it did not happen overnight. We've been highlighting this for many years [Dec 8, 2007: Do the Bottom 80% of Americans Stand a Chance?] - and in the coming 5-10-15-20 years we'll have our new asset spikes, cyclical peaks and the like. But we have not changed the underpinnings. We continue the course and have covered over reality with paper printing prosperity. [May 19, 2009: Paper Printing Prosperity Defined] It will get worse from here in the next few cycles (next 10-20 years) as politicians get even more desperate to hide reality. That's the only solution we know in America. So until a wholesale change comes at the grass roots I simply do not see any of this changing - expect government to grow and grow - healthcare to bloat even further as that is our only real job growth. And more and more stealing from the future to fund the now. That blame can be placed on the US citizen because he is happy to take take take without asking what the costs are. There is no will in our leadership to see reality and explain it... and no will in the citizens to hear it. In fact I doubt many in leadership see it my way. Because they live in a parallel universe, a cocoon of comfort - and everything "as is" is just fine for them. It will all end terribly badly - but perhaps we can keep the mirage going for another decade. Unlike Japan, I expect when we truly implode our debt to GDP will be still growing at a 45% angle. These issues are not about a recession, a recovery, green shoots, or Kool Aid. We have a structurally broken system that no one will acknowledge, that is now being intertwined with an evolution of globalization. So let us enjoy our rollicking stock market and drink Kool Aid. But if you are going be reading this site, you are going to hear the ugly truth of what is happening in the background. At least my version of it.